Somerville, Mass - These days, Moscow nightlife is much about being elite. The trendiest spots are guarded by bouncers who take their job a little too seriously. The use "face control" to keep out potential patrons who won't enhance the atmosphere at their establishment by looking fabulous and spending money. And they really do call it "face control". But it's about so much more than your face. It's a quick and devastating head-to-toe examination to determine if you are the kind of person that they want. It's based largely on what you are wearing (but notice they don't call it a dress code - it's way too arbitrary for that). Stepping out in Moscow requires dressing up, especially for women. Short skirts and tall heels are an absolute must. But it's not only that women have to wear short skirts and tall heels - they also have to look good in them. My friend Tommo told me a story about an expat friend - let's call him "Matt" - who organized a private party at a Moscow club. When Matt showed up at the club with two slightly overweight female friends, who happened to be from Australia, the bouncer refused to let them in. "But this is my party," Matt protested. "You can go in," the bouncer replied Then, jerking his head in the direction of the women, "But they can't." "But they're with me," Matt was flabbergasted. "They are with me and this is my party. I'm the one who decides who can attend." "Sorry buddy, we have standards." Fortunately, this conversation took place in Russian, so the Aussie chicks didn't understand what was going on. I have no idea how Matt explained why they were not admitted to his party. One surprising fact about face control: it's much tougher on women than on men. That's because good women outnumber good men in Moscow by huge proportions. This has always been the case, due to wars, alcoholism and poor health, not to mention the general brutishness of Russian men (exceptions dually noted!). Russian women are well aware of their odds, so they go to great lengths to make sure they are as attractive as possible. So the clubs can afford to turn away any women who do not meet their "standards" because the bouncers know that some other drop-dead gorgeous devki will be along shortly. If possible, book a table. Dress up: think short skirts and tall heels for women, black for men. Arrive by car. The bigger the better. Arrive in a small group, preferably with more men than women. If you're alone, imply that you're meeting somebody, even if you're not. Speak English. Foreigners are not as special as they used to be, but they're still pretty special. And they still (supposedly) have money. And if all else fails, you can always hire the `nightlife concierge' that is employed at the Ritz Carlton. No joke - his job is to help his patrons get past face control. Honestly, all this business leaves a bad taste in my mouth. Moscow nightlife reviewer Micha Rinkus wrote that "The Western egalitarian is easily bruised by the blatancy of face control...' and she was talking about me. Frankly, I don't see what all the fuss is about... Moscow is filled with fun and funky places, beatnik bars, bohemian art cafes that would be more-than-happy to have me walk through their doors. (And no, they are not filled with ugly people.) Why would I want to subject myself to that scrutiny and possible humiliation? Even if I get in the bar - nine times out of ten I can't even afford to buy a drink! I seem to be in the minority with this opinion, however. The Moscow entertainment publications like element (www.elementmoscow.com) focus almost exclusively on these upscale, elitist places, as do several popular nightlife blogs. There is Max Campbell (www.moscowmaximum.blogspot.com) who writes indepth club reviews, including detailed descriptions of the clubs' interiors, critiques of the music and comments on the attractiveness of the women. I guess those are pretty much the important factors. My favorite is Moscow Doesn't Believe in Tears (www.moscowdoesntbelieveintears.blogspot.com), who provides hilariously biting commentary about Moscow clubs and the characters that frequent them. Complete with photos. Tthis is exactly how I like to experience the Moscow club scene - so I can make fun and laugh, but I'm in no danger of being humiliated myself. Thank you, MDBT! Thanks to you, everybody can enjoy Moscow nightlife! And while MDBT is donning the high heels, slipping through face control and sneaking photos, I'll be up the street at a more "democratic" bar, getting my groove on with the two Aussie chicks. Somerville, Mass - I'm still hard at work writing about Moscow. This week I was writing about shopping and where to get the best Moscow souvenirs. This is an excerpt from the Moscow City Guide. 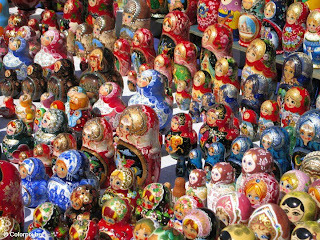 Rare is the tourist that leaves Russia without a matryoshka. The hand-painted wooden nesting doll which so symbolises Russia is not, as you might imagine, an ancient handcraft developed and perfected by generations of peasant families. Rather, the concept was adapted from a traditional Japanese toy. In the 19th century, Russian artists were eager to embrace cultural styles that would unite traditional and modern elements, and contribute to the growing sense of national identity at that time. Savva Mamontov, a celebrated patron of the arts, established art studios at his Abramtsevo estate where artists could do just that. Toys were considered a particularly creative form of folk art, and Savva's brother, Anatoly, set up a workshop to revive and develop folk-peasant toys. In this workshop, Mamontov had a collection of toys from around the world, including a Japanese nesting doll depicting the Buddhist sage Fukuruma. Inspired by this prototype, the toy maker Vassily Zviozdochkin and the artist Sergei Maliutin created the earliest Russian nesting dolls, identifiable by their Slavic features and peasant dress. During this time, Matryona and Matryosha were popular female names. Derived from the word for 'mother', the names conjured up images of a healthy, plump woman with plenty of children. 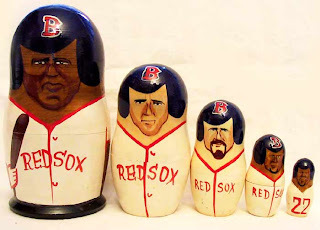 Thus the diminutive of the name was applied to the nesting dolls, symbolic of motherhood, fertility and Mother Russia. At the beginning of the 20th century, large-scale production of the Russian matryoshka began at the toy centre at Sergiev Posad. Here, artists developed a unique, realistic style of painting the dolls, depicting colourful scenes of village life, patriotic historical figures and beloved literary characters. The Bolshevik regime began cracking down on this creative outlet as early as 1923. The exhibition and sale of any matryoshki not consistent with the regime's artistic or ideological goals were banned. The ban also included the depiction of such controversial figures as tailors, bakers and any entrepreneurial types; Gypsies (Roma), Jews and other ethnic groups; fantastical figures such as mermaids and goblins; and so on. Eventually, the matryoshka's diversity and creativity diminished, and she adopted one standard female image. Factory production began in the 1930s, and this 'art' was nearly lost. The 1990s saw a revival of the more original matryoshka, designed and painted by individuals. Production returned to artists and craftsmen, who are free to paint whom and how they wish. As a result, modern-day matryoshki take on every imaginable character and style. Somerville, Mass - It seems like it's been decades that we have been saying that Union Square is "up and coming". In fact it has been seven years - ever since we moved into the pink house, which is a four-minute walk from this mini urban center. In that time, we have seen businesses open and others close, but there are always customers in the Ex-con-venience Store. That place isn't going anywhere. I still believe that Union Square is on the upswing, despite the construction that has been ongoing for about a year, and the recent closure of my favorite shoe store (while I was off buying shoes in Italy - I have only myself to blame! )Aside from the businesses that come and go - and others that endure - there is a sure sign that Union Square is on the upswing: community events. In recent years, Union Square hosts a thriving Saturday-morning farmers' market, which attracts shoppers all the way from North Cambridge. Our little square also maintains a regular schedule of fun and funky events organized by the Union Square Arts Council. So this afternoon we went to the Somerville Rock & Roll Yard Sale, which was a mini flea market of used records, old stereo equipment, handmade jewelry and vintage clothing. The crowd was impressive, ranging from yuppie to goth, along with plenty of kids and dogs. I was disappointed that the Sikh gentlemen were not in their usual benches in the middle of the square. But it was a pretty diverse crowd, nonetheless. The local bars and cafes seemed to be doing a brisk business (although nobody was buying shoes). Unfortunately, the yard sale did mean that the new bar Precinct could not set up its outside tables, which has been a draw this summer. From a rock & roll point of view, the yard sale received mixed reviews. There were a lot of different dealers, with plenty of vinyl for sale. But the place was crowded, so it required jostling for position, just to get a chance to rifle through the boxes. We went in search of glam rock (apparently we really need to add Ballroom Blitz by The Sweet to our record collection). But we had to settle for British invasion (an early album by the Kinks). True, it takes ten minutes to drive through the Union Square because of the row of orange barrels blocking off this or that lane. That's why you should get out of your car and walk... you might just find live music, congenial crowds and maybe - just maybe - that Beach Boys album you wanted.